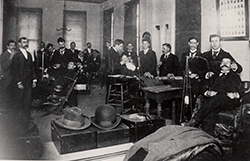 The Harvard School of Dental Medicine’s (HSDM) early beginnings are rooted in a bold idea in 1867 that would forever link dentistry and medicine, and raise the bar for dental education. At a time when dentistry was largely a trade requiring no formal education and focusing on extracting decayed and damaged teeth and plugging cavities, Boston physician and Harvard Medical School alumnus Nathan Cooley Keep, M.D., viewed oral health as vitally important to the health of the whole body. Dr. Keep was determined to establish dentistry as a branch of medicine. His perseverance paid off on July 17, 1867, when Harvard University established the first dental school in the the United States to be affiliated with a university and its medical school. Known as Harvard Dental School, it also became the first dental school to confer the Dentariae Medicinae Doctor (D.M.D.) degree, a title that emphasized students’ medical training. This was a seminal step in creating the academic environment and prestige for dentistry to be a learned profession. Dr. Keep became the first Dean of the school; the castle “keep” in the school’s shield honors his visionary role to this day. Early on, the Harvard Dental School became known as a pioneer in dental education, and an early proponent of diversity in dentistry. The inaugural class included Robert Tanner Freeman, D.M.D., a son of former slaves. In 1869, Dr. Freeman became the first African-American in the country to graduate from a dental institution. Shortly after Dr. Freeman, George Franklin Grant, D.M.D., became the second African-American graduate of the dental school, and went on to become the first African-American faculty member of Harvard University. Harvard Dental School quickly earned an international reputation for its high standards and thorough professional training in dentistry. The school offered a two-year D.M.D. curriculum as early as 1875, and by 1885 required its students to have a college degree, or to pass an examination in English and Physics. By 1916 it became the first dental school to establish a student research society. 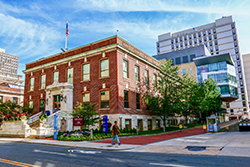 The school’s name changed to Harvard School of Dental Medicine (HSDM) in 1940 to better reflect its focus on medical research and science—a focus that continues to leverage scientific strengths in the areas of skeletal biology and the pathology of bones, joints and connective tissues. In addition to educating skilled clinicians, Harvard’s curriculum fostered leaders and educators in dentistry by emphasizing critical thinking and requiring students to experience research. With this research advantage, the school became the first dental institution to receive training grants from the National Institutes of Health’s National Institute of Dental and Craniofacial Research. HSDM has also led the way in creating new programs of study and problem-based approaches to learning. A combined oral and maxillofacial surgery/M.D./general surgery program was established 1971, and later a combined dentist–scientist program (D.M.Sc./M.M.Sc.). Both programs have had a significant impact on the profession by setting the standard for programs at other institutions, and creating leaders in dental education, research and practice. Just this year, HSDM announced a new two-year program leading to a M.M.Sc. in Dental Education to train the next generation of dental educators. The same guiding principles that motivated Dr. Keep to unite dentistry and medicine continue to be reflected in HSDM’s curriculum. Today’s D.M.D. students spend the first year of their four-year program learning alongside their medical school classmates. They also learn about the integration of oral health and primary care with rotations in the Teaching Practices of the Harvard Dental Center. Like the dental students who came before them many years ago, they gain an intellectual experience that reflects the biological underpinnings of oral and systemic health, the value of evidence-based research, and the importance of clinical study, true to the founding vision. To learn more about HSDM’s history, visit 150.hsdm.harvard.edu.